With the re-introduction of the straight, pivoted tonearm for Scratch DJ applications, I have decided to dredge up the design data that describes it. It is not new. The data presented in this document is from the Radiotron designers handbook circa 1955. The Audio Engineering bible. The Straight tonearm has historic underpinnings as the first tonearm design style. It wasn't until the 1940's that serious math was applied to the phonograph tonearm. From that math evolved the more common overhung, offset tonearm we see most common today. The "S" shape, "J" shape or the straight, long arm with the angled head shell. All these arms angle the cartridge at approximately 18° and overhang the spindle by about 0.5" and are meant for hi fidelity playback. The purpose of this article is to show why the Scratch DJ straight arm cannot be used for serious listening and may even do harm to your records if certain stylus shapes are used with it. You can tell the two different straight arm types apart very easily by seeing where the stylus lands relative to the spindle. Just bring the arm over to the spindle. In a high fidelity arm, the needle will "overhang" the spindle by 1/2" or so. In a scratch DJ arm, the needle will "underhang" or come up short about 3/8" behind the spindle. Also the high fidelity arm will have an angled headshell. The Scratch DJ arm will not. The high fidelity tonearm has a maximum tracking error of around 2 degrees which is good. This results in a maximum distortion from tracking error of around 0.75%, also good. The Scratch DJ straight arm has a tracking error that varies from -6 degrees to + 17 degrees which is terrible. This results in a maximum distortion due to mistracking of 6.7% which is terrible. Take note that the error varies from a negative angle to a positive one as it moves across the record. This means that there is only one point where the error is 0. Changing the cartridge angle, as some Mfg's recommend, will reduce the error at one end... only to increase it at the other! For best results, keep everything straight. 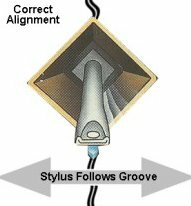 The Following 2 drawings depict the stylus with proper groove alignment and the maximum mis-alignment that occurs when using the scratch DJ straight arm. It is important to understand that the stylus suspension allows the stylus to swing side to side and up and down; BUT NOT FORWARD! The stylus is presumed to be rigid to forward movement. Note in the 18° error drawing that the groove is clearly trying to move the stylus forward. Since the stylus cannot do this, it will chatter and move up against the groove. This is where the groove wear is at it's greatest. The following images and text are taken verbatim from the Radiotron Designers Handbook. Just so you don't think that I am making all this up! So with this information out in the open, it should be clear that for the best hi fi reproduction, the offset arm is the best choice. The Scratch DJ straight arm is not. The straight arm has found a new home with Scratch DJ's, because, the needle is more stable in the groove when the platter is being spun back and forth as that artform requires. The trade off is excessive groove wear and distortion. 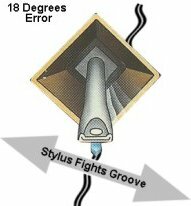 Because of the excessive tracking error of 17 degrees, you must never use elliptical styli in a Scratch DJ straight arm. The fine edges of the elliptical profile depend on near perfect tangental alignment. With an error of 17 degrees, these fine edges become sharp cutting tools and will shave the surface of the vinyl groove. Stick with conical or spherical shaped styli when using a straight Scratch DJ tonearm. This presents a dilemma for the home enthusiast because many of these Scratch DJ turntables are coming equipped with 78 speed which makes them appealing to record collectors. Our advice is to choose a conventional offset tonearm style instead. Leave the straight tonearm for the Scratch DJ's. If you have read this and understand it, tell a friend and pass the word. It will make life alot easier for the collector or audio enthusiast about to make a turntable purchase. 1. Were discussing Scratch DJ straight pivoted underhung tonearms, not linear tracking straight tonearms nor straight tonearms with proper overhang and the offset angle in the headshell. 2. Some turntable mfg. 's have recommended offsetting the cartridge in the headshell with these Scratch DJ straight arms. Do not do it! As the article instructs above, keep everything straight. You should not introduce an offset angle into a straight underhung tonearm.